The product I have been using for a couple of months now is an organic wear bronzer from Physician formula and this product is 100% natural origin bronzer, formulated with 15% certified organic ingredients, including jojoba seed oil and corn starch to moisturize and mattify the skin. This product has a very cute packaging and it has little leaf designs on the bronzer itself and the packaging is cardboard so it helps lessen the impact when you drop it so it’s less likely to break. 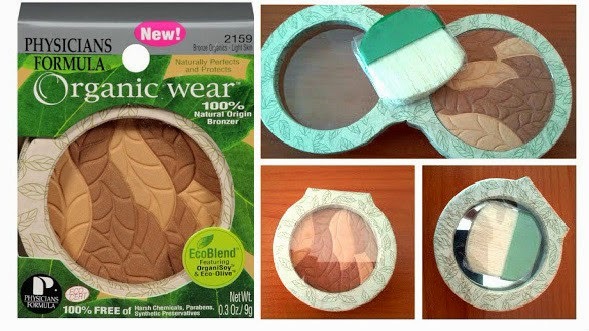 I love the fact that the packaging is cardboard because it gives the product a more organic nature look and it's all natural so therefore, my skin hasn’t had any bad reactions or any breakouts however, the smell of the bronzer is not the greatest it has a very distinct scent/smell to the powder of which I’m not fond of however, the bronzer is like using a press powder, it’s very light and it applies very smoothly and blends very well. This is the first product I've tried from Physician formula and I am very happy with my bronzer thanks to my sister. I’m not really sure where she got it but I do believe that you can find their products at Dischem and I'm not exactly sure what they go for but i'll have a look at Dischem and then add it to this post for you guys. If you guys do know of other stores that stock Physicians Formula products please let me know so I can go and check them out.